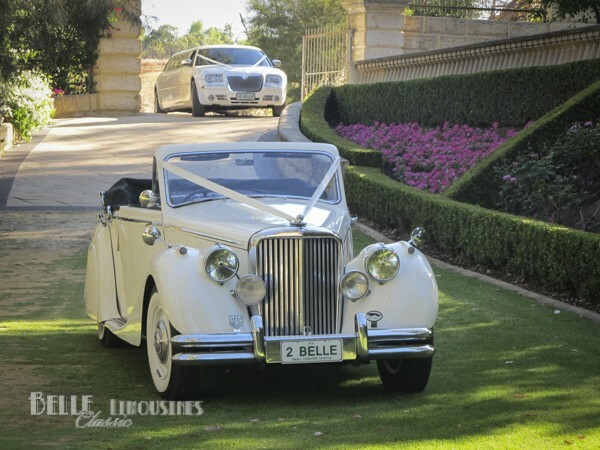 Belle Classic wedding cars are one of the highlights of many Perth weddings. Established in 2007 we have assisted over 5000 couples to celebrate their weddings in style. We currently assist with around 600 weddings each year. 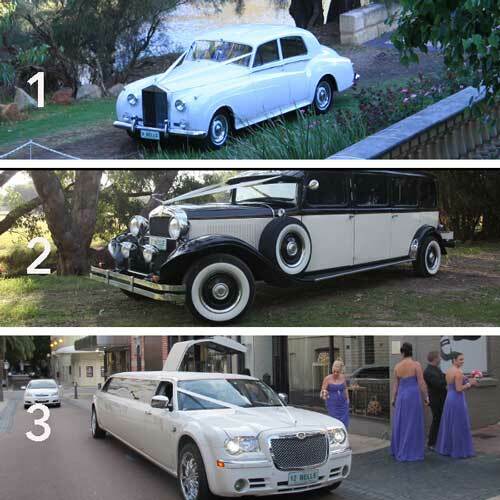 What style of wedding transport are you? 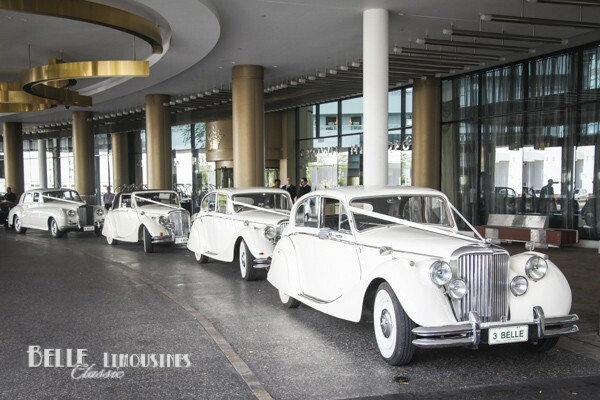 The simple question can be – do you want a modern limousine or traditional wedding cars? If you have arrived at this page simply to make an inquiry, then our quick contact form may be all you need. For our article on steps to plan and secure quality wedding transport from a reliable supplier simply scroll on past the form. We at Belle Classic Limousines chose Chrysler limousines for our fleet because the high side panels and narrow window line match the core style of the 1950s classic cars. The most popular wedding cars are luxury British makes Rolls Royce, Bentley, Jaguar and Daimler. 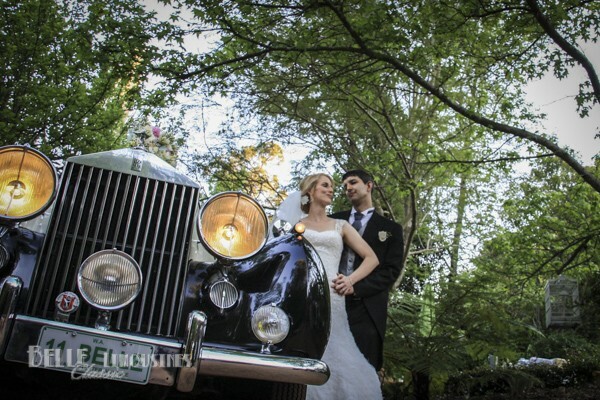 Classic American cars such as Cadillac, Chevrolet and Fords are also used as wedding transport. Modern Chrysler limos are a good match to the British classic cars if you have a large bridal party (as mentioned above). Choosing between sedan based four passenger classic wedding cars or modern Chrysler limousines that can transport a whole wedding party of up to ten passengers is probably the first decision. A variety of wedding transport combinations can be seen on various pages and posts throughout the website to help you select your favourite wedding cars. There is also information on the traditional wedding transport formats and more modern variations which can include a mix of classic cars and modern limousines. 3 Do your venues have restricted access for limousines? 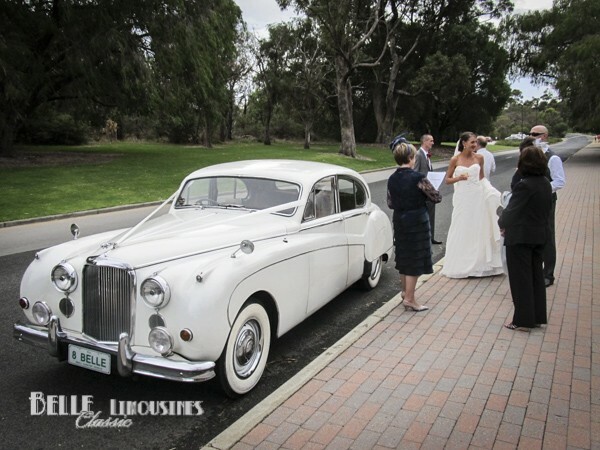 Several venues in Perth have limited access for some wedding cars and especially stretched limousines. 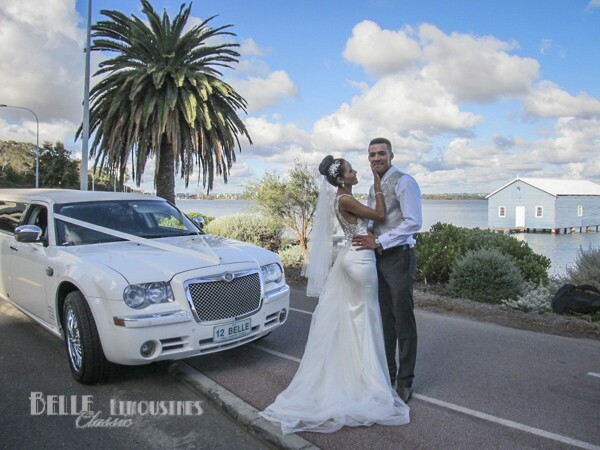 Belle has reviewed the limo access to popular Perth wedding venues for you. It is worth looking into your venues before settling on a particular style of wedding transport. Do you know which prominent church in Perth cannot be accessed by Chrysler or Hummer limousines? 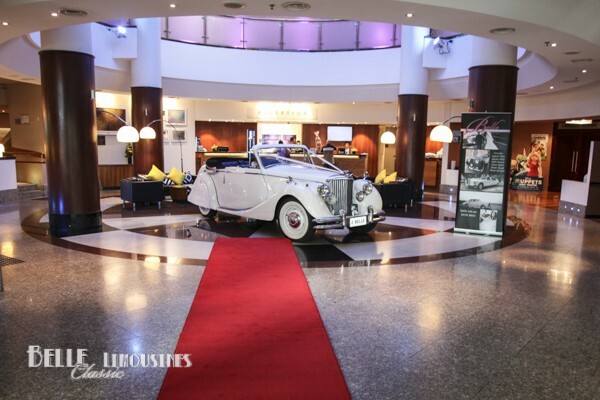 There are also several hotels that cannot accommodate stretched limousines in their entry drives – consider getting dropped at the footpath and climbing up entry ramps to the reception, not the best look for your wedding entrance. How long has the business been operating? Belle is in its 9th year. What happens if you need to adjust your booking (change the date or hours of hire)? Does the owner intend to sell the business? Compare the quality of correspondence from the businesses and information requested for your booking. Some limo operators gather few real details of your day so they can bend the booking to their advantage closer to the hire date. Look in their diary…. if it is full of messy notes that you cannot follow, then there is a good chance that they will get confused trying to prepare for your wedding day too. For several limo businesses their diary is the only record keeping they have. Scary when you think about it. Often in business you will find that the limo hire company that charges a little more for their services is running a sustainable business, whilst those that offer ‘too good to be true’ prices or discounts are on the edge of survival, a filling their booking schedule in preparation to sell the business or struggle to get work for other reasons. No saving on price is worth the frustration of finding out the week before your wedding that the booking you made and paid for is worthless. A month before the wedding is too late to secure services for popular dates – be safe not sorry. Belle Classic Limousines currently have five star ratings on all of these sites – check it out and compare with other businesses. Following years of dedicated service we are also a preferred wedding car supplier at many of Perth’s leading reception venues including: Acqua Viva, Ambrose Estate, Bathers Beach House, Belvoir Homestead Reception Centre, Brookleigh Estate, Brookside Winery, Burswood on Swan, Carilley Estate Winery, Caversham House, Core Cider House, Crown Towers, Darlington Estate Winery, Duxton Hotel, Joondalup Resort, Mallard Duck Restaurant, Mandoon Estate, Millbrook Winery, Mosmans Restaurant, Mount Lawley Golf Club, Mulberry on Swan, Novotel Langley Hotel, Pagoda Resort and Spa, Parmelia Hilton Hotel Perth, Riverbank Winery, Rose & Crown Hotel, Sandalford Winery, Sittella Winery, and Willow Pond. Oddly, but not surprising these days, most wedding car hire bookings are made on-line. Even if you trust that the wedding cars are comparable by looking at the on-line pictures it is essential that you telephone and talk to people in the business. If the phone manner is short and unhelpful you can expect that on your wedding day. Usually the guys get the task of choosing and booking the wedding cars. Strangely the girls end up doing both in 90% of weddings. You may not be surprised that many inquiries are made months before the booking is sent through. A classic example was a couple that viewed wedding cars in January for an October wedding and the bride chose the Rolls Royce Cloud for her wedding car. The groom finally called in July to book the car which had since been booked to another couple. Choose and book your wedding cars the week (or as soon as possible) after securing your venues, especially for Saturday weddings. Be wary of a business that directs you to make cash payments. All bookings should be secured by a contract or agreement stating the booking schedule and payments receipted on an official invoice. If the business systems are too casual it can often lead to lost or double bookings or disputes about the hire schedules discussed at the time of booking your wedding cars. Join the business’ Facebook page or Google Plus circle to follow their postings. If you are not into social media sites at least send a short email or phone with a question a month or two out from your wedding. If you have a problem it is better to identify it with a few weeks warning rather than be caught out just before the wedding day. Belle Classic wedding cars owners John and Sue care that their business cares for the couples who entrust them with their wedding transport. The staff are friendly with a service orientation. You can be confident that we honour all bookings and spend the time to provide detailed information about our processes and highlight some of the pitfalls that a few other businesses can lead you into. When you choose to book with Belle, thank you. File away your booking agreement and schedule a follow up shortly before your wedding day. We attempt to touch base with all couples the week before the wedding for a final confirmation. You will receive an email of the schedule for each car or limousine involved in your hire. If you do not receive the email or there is an address or timing issue with your schedule contact the office to ensure every thing will run smoothly on your day.